Metals Never Die | continent. Figure 1. Granules resulting from the recycling process of e-waste at Immark AG Regensdorf/Switzerland. Copyright: Research team Times of Waste 2015. “When I grow up I wanna be an old woman,” sings Michelle Shocked as we are driving through the foggy Po Valley on New Year’s Eve. The surprising and slightly absurd lyrics still appeal to me listening to the song after a long time. Why the wish to be old while young? What do “old” and “young” even mean? 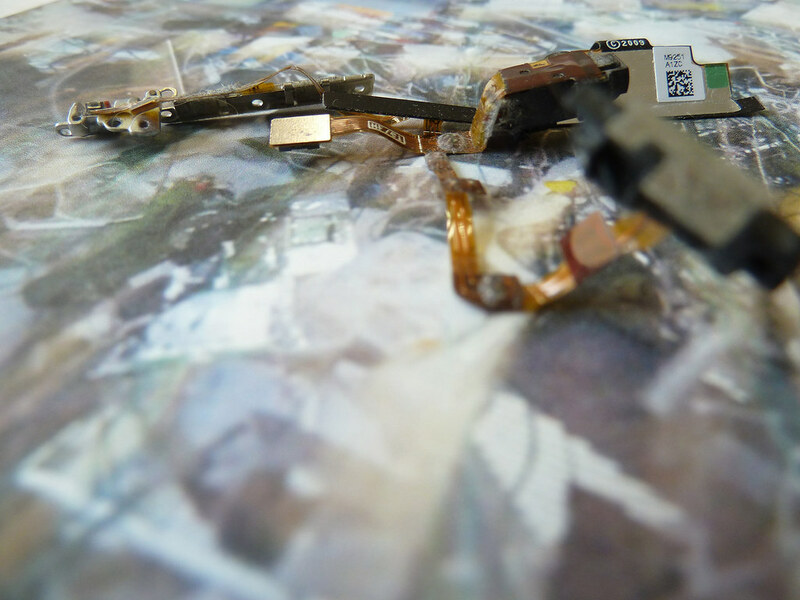 Recurrent images and sounds from our field research at the recycler of electronic waste, Immark, looking at transformation and reassessment processes: Granules as sellable, valuable material generated in a process of transformation. Objects, regarded as useless and worthless, get upgraded in their shredding. The consideration of waste as a ‘new’ resource is a matter of perspective and depends on points in time and stages of materiality. This differentiation is contextual, it depends on a constituting interplay between human and non-human actants. Waste can become a new resource, and on the other hand, ‘new’ might involve a destination: as in the case of smartphones, one of our research objects/subjects, which is designed to be dumped. It has a primary use cycle of no more than 18 months, its near-seamlessly integrated high-performance electronics making repair difficult. Smartphones are destined to become garbage. The smartphone emits most of its problematic waste before, not after it is sent to market. It is the mining industry, the usually open-cast pit mining which unearths the smartphone's almost 60 metallic mineral components, that produces huge amounts of toxic waste or, in the case of neodymium generates radioactive waste, harming the whole environment. Additionally, mining exploits human beings by low social and security standards. So you could say that a smartphone’s destiny is to be literally born as garbage. These metallic components are as long lasting as they are miniscule, almost invisible. In all likelyhood, a modern smartphone comprises at least a few atoms of copper that were originally mined during the Bronze Age, as one of our interviewees, Rainer Bunge from the HSR Hochschule für Technik Rapperswil, put it. The elements contained in a smartphone, especially metals, never die. Metals are likely to have a long history before they become part of a smartphone: they outlive their hosts and have the capacity to link eons, link a bygone Bronze Age with the Anthropocene. In this case, what do “old” or “new” mean in the context of post-anthropocene aesthetics? It raises questions as: How could we generate visibility for the unseen? For the traces of the hardly visible, but long lasting componentry? What if the final journey of trash was not always out of sight, banned from our consciousness? Metals cannot be erased from earth but there are always losses: destruction happens through mixture. Some materials in a smartphone such as rare elements are added to other components such as glass (to provide the colors on the flat screen). Furthermore, it is exactly the modern machines in recycling centers that (re)mix matters instead of disassembling them like African and Indian recyclers do. “Waste”, said Bernd-Stefan Grewe in one of our research project workshops, “is matter that is too much mixed.” Waste is matter that cannot be recovered from valuable components, at least not in an economically sensible way, or that cannot be manipulated anymore, because it is too fluid or too small. Still sitting in the same 17 year old car and listening to the same song by Michelle Shocked copied from a CD to a tape – now both obsolete technologies. Time is somehow preserved in that car. In a different history, the grown up girl in Shocked’s song might find the remains of the magnetic material of the car’s tape recorder re-used in music equipment of a post-anthropocene aesthetic. Figure 1 and the sound essay have been created from material gathered at our field visit at Immark AG Regensdorf/Switzerland during recycling processes of electronic waste; Figure 2 contains an artefact (charging port connector) gathered at a workshop on disassembling old mobile phones organised by Designgut and Gewerbemuseum Winterthur. The accompanying thoughts emerged from adapting and re-assembling material from the German-language research project Times of Waste, especially the essay “Times of Waste“ in Behind the Smart World – saving, deleting and resurfacing data and the performance Community in Progress – Syntegrity, a collaboration of Kevin Rittberger/Theater Basel with the Critical Media Lab of the Academy of Art and Design FHNW. The interdisciplinary research team consists of a core team of six people with backgrounds in visual anthropology, environmental studies, art theory & practice, scenography, as well as music and programming: Flavia Caviezel (lead), Mirjam Bürgin, Anselm Caminada, Adrian Demleitner, Marion Mertens, Yvonne Volkart, associated: Andreas Simon. Most of the members have already been collaborating in the preceding project RhyCycling. Aesthetics of Sustainability in the Basel Border Area, 2010-2013; Times of Waste runs from 2015-2017. Both projects are situated at the Institute of Experimental Design and Media Cultures’ Critical Media Lab at the Academy of Art and Design FHNW and funded by the Swiss National Science Foundation. The HSR is a member of the University of Applied Sciences of Eastern Switzerland and offers education in different areas of engineering and information technology. In the context of Times of Waste, we approach a concept of post-anthropocene aesthetics primarily by raising questions about how the entanglements of humans and non-humans could be more egalitarian and effective (than in anthropocene circumstances), how therefore research practices could help overcome representational ‘obstacles’ we face dealing with objects or artefacts, and which aesthetical consequences these practices might have in regards to the results of our research.